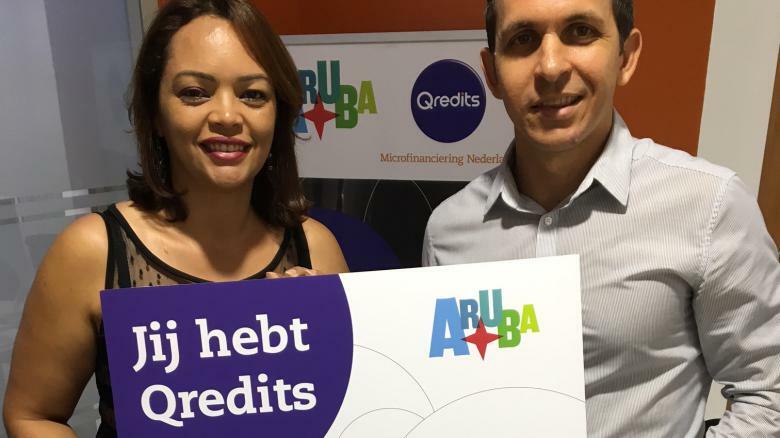 The 1st Qredits’ Microloan of Aruba was issued today to entrepreneur Ydimar Zerraga. With this investment she wishes to realize her dream of expanding her business ‘You and I Lingerie’. Qredits has been active in Aruba since the beginning of April: here starting and current entrepreneurs can receive a loan up to Afl. 50.000,- to start or expand their businesses. Ms. Zarraga has been presented the symbolic check this afternoon at the Qredits office situated in the MFA Noord. Ydimar is a local entrepreneur who has been managing her own clothing store since for one year now catering lingerie to plus-size women. With her Microloan she intends to strive for further growth going forward. Qredits Aruba has as its objective to support entrepreneurship in Aruba by offering loans up to Afl. 50.000,- to (starting) entrepreneurs as well as coaching. Since the opening in April dozens of (starting) entrepreneurs have been knocking on Qredits’ doors for among other things financial support. The 2017/2018 objectives are to grant about 100 loans with an average of Afl. 30.000,-, to coach over 200 aspiring entrepreneurs with the set-up of their own businesses and to offer the educational entrepreneurship program Becoming my Own Boss to 250 students. The Qredits e-learning Writing a Business Plan has been translated into Papiamento, English and Spanish and will be offered to aspiring entrepreneurs. Vouchers to this end are available at the Qredits office and at the Chamber of Commerce. Since its introduction more than 30 vouchers have been handed out. For more information on Qredits Aruba visit www.qredits.com. The website is available in four languages: Papiamento, Dutch, English and Spanish. One can simply apply for a loan through the website.